Based on the 911 GT3, the Porsche 911 Speedster drop-top pays homage to the original 356 Speedster from 1948. Porsche has revealed the production version of the 911 Speedster. Showcased as a concept at the 2018 Paris Motor Show, the 911 Speedster is basically a convertible version of the current GT3 (991.2 generation 911) and pays homage to the original Porsche 356 Speedster from 1948. In fact, owing to this, Porsche will only be producing 1,948 units of the 911 Speedster. As mentioned already, the 911 Speedster is based on the GT3, and this means that it comes powered by a naturally aspirated 4.0-litre flat-six engine that develops 493bhp of power output and 460Nm of torque. Porsche says that for the Speedster the engine has been further enhanced as it gets individual throttle bodies from the 911 GT3 R race car. The engine is available only with a six-speed manual gearbox, which sends the drive to the rear wheels. 0-100km/h is done in 3.8 seconds, while the top speed is 309km/h. 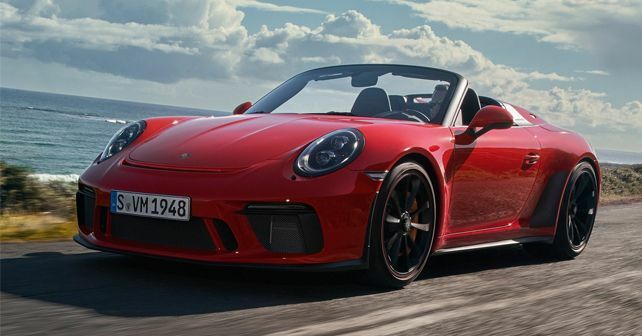 Like the standard GT3, the 911 Speedster gets the best of Porsche’s performance features, such as adaptive dampers, Sport Chrono Package, dynamic engine mounts, rear-wheel steering, carbon ceramic brakes, et al. Coming to its styling, the Speedster’s nose is identical to the 911 GT3, but because it’s a convertible, it gets a short windscreen and a double-bubble decklid that houses a manually-controlled fabric roof. Other unique design elements included 20-inch alloy wheels with centre lock and Speedster badging on the bodywork. Inside, Porsche’s obsession with weight saving continues as the Speedster has fabric pulls instead of door handles, and door bins are replaced by fabric nets. You don’t even get air conditioning as standard, but Porsche will install it at no cost in case the customer demands for it. The 2019 Porsche 911 Speedster will be showcased at the 2019 New York Motor Show, and customer deliveries will begin early in May.